Videogame BANG! 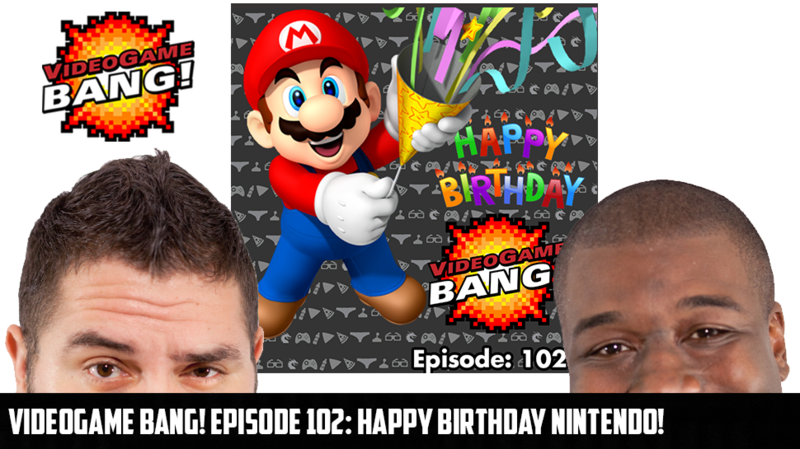 Episode 102: Happy Birthday Nintendo! Happy Birthday Nintendo! For 126 years old we have to admit Nintendo is looking pretty good. We decided to make this a special themed episode in celebration and invite a very special guest and first time panelist to the show Nerd Reactor’s own: Joey Ferris. Joey is a YouTuber and writer with a passion for Nintendo and is a major advocate for the Wii U. We get to know Joey better and talk Nintendo’s greatest hits and biggest misses. We also talk about the future of the company and much much more! Along with Joey we have the old band back together as Cory and Aaron are joined by fan favorite Steven Gutierrez! And of course we have to thank NerdReactor.com and our amazing Studio Sponsor: Corsair Please if you have not already this podcast is subscribable via pretty much every podcast app available: iTunes, Stitcher, Soundcloud and dozens more! If you do not see us on your podcast app of choice let us know and we will get on there for you!